In April, Alasdair Foster will present an exhibition of work by three artists entitled ‘Industry re.Imagined’. The exhibition will be staged as part of the Festival of Industrial Photography in Shenyang, northern China. The artists are Alejandro Chaskielberg (Argentina), Marcus Lyon (United Kingdom) and Roger Hanley (Australia). Each artist reveals a distinctive and unexpected vision of industry: as a fading memory, as a global network and as a theatre of the psyche. The exhibition opens 23 April, 2016. On Friday 29 April Alasdair Foster was the opening keynote speaker at a festival of bold childhood ideas staged at the Art Gallery of NSW by Gowrie NSW. He argued that “children are born with a strong propensity for creativity, but conventional education is specifically structured to remove it by the time they reach puberty. This shapes children to become adults in a looking glass world in which they consume other people’s ideas rather than working together to find the best outcomes for their community.” The one-day conference, entitled ‘Down the Rabbit Hole’, sought to challenge leaders in education to broaden their perspective on culture, inclusion, gender and identity. This exhibition brings together artists from Argentina, Australia, Canada, Colombia, Korea, Japan and the United States to explore the many and complex ways in which photography and memory come together. Sometimes the one can shed light upon the other but, at others, they play a complicit game of subterfuge. Выставка объединяет художников из Аргентины, Австралии, Канады, Колумбии, Кореи, Японии и США и исследует многочисленные и непростые пути взаимодействия фотографии и памяти. Порой одно проливает свет на другое, но временами память и фотография играют сообща и прибегают к сложным ухищрениям. On Thursday 21 July I graduated Doctor of Philosophy. My thesis, ‘Culture and the Conversive Community: Framing Arts Policy for the Twenty-first Century’, questions how we might develop an egalitarian arts policy. It was passed without emendation. This exhibition introduced Russian audiences to the work of four Australian artists: Hoda Afshar, Ray Cook, Simon Harsent and Owen Leong. These artists use photography to explore radically different concepts of climate change that span the personal, the social, the cultural and the environmental. In each case they approach their subject indirectly, through the poetic language of visual allegory. It was my honour to chair the judging panel for the self-published category of this year’s Australian Photobook of The Year Awards 2106. The winner was Jordan Madge for his book ‘Red Herring’, which he both photographed and designed. Alasdair Foster is the curator of the Australian exhibit presented in Dubai this March as part of Dubai Photo Exhibition 2016. Staged under the Patronage of His Highness Sheikh Hamdan Bin Mohammed Bin Rashid Al Maktoum, the Crown Prince of Dubai, the Australian work will sit alongside presentations from 23 countries prepared by 18 leading curators from around the world. SO, WHAT IS IT WE DO, we people who love art and photography…? ‘Dream Home’ features the work of four artists and one artistic partnership hailing from four continents. They each, in very different ways, explore the psychological dislocations between the consumerist ‘dream’, domestic convention and the complex, sometimes dissonant, interior life of the individual. Alasdair Foster put the exhibition together especially for the 2015 Pingyao International Photography Festival, China’s largest and longest-running festival of photomedia art. On Saturday 29 August, it was my great pleasure to open an exhibition by the talented Melbourne duo Gerard O’Connor and Marc Wasiak. Photographer O’Connor and designer Wasiak work with a team of production technicians, actors and models, and the post-production skills of Matthew Ryan at Visual Thing, to create nineteenth-century tableaux with a distinctly twenty-first century eye. The work of artists from Australia, Korea, Ukraine, UK and USA will feature in an exhibition especially curated by Alasdair Foster for the 2015 Pingyao International Photography Festival. The exhibition explores the psychological dislocations between the consumerist ‘dream home’, domestic convention and the complex, sometimes dissonant, interior life of the individual. Drawing on a range of perspectives shaped by personal experience and social critique the artists each brings a fresh, distinctive and sometimes troubling insight to the place we call home. More information about the event and the book published to mark the occasion here. Magdalena Bors’ exhibition, ‘The Art of Domestic Compulsion’, will tour Spain through to 2015, showing in Almería, Seville and Barcelona. Curated by Alasdair Foster for Galleri Image in Denmark, the exhibition is presented in partnership with the Centro Andaluz de la Fotografía. IN THIS SERIES OF INTERVIEWS, Alasdair Foster talks with cultural practitioners who take an alternative approach to creativity – their own or that of others. These individuals hail from various cultures and continents; they have diverse aspirations and idiosyncratic means for achieving them. There is no consistency, no single path. Nor should there be. Some look critically upon the world around them – be it the institutional world of art or the wider world of human affairs. Others seek to build connections where previously there was alienation; offering a means of expression to the marginalised and the dispossessed. And some simply try to feel their way to a sense of personal truth that can be communicated outwards in the centrifugal language of the eye. Each, in their different way, suggests how a questioning mind, human connection and creativity can work synergistically to achieve results significantly more valuable than those measured by the market or celebrity. In 2013 the respected Chinese magazine PhotoWorld commissioned Alasdair Foster to write 13 articles, each of which featured an Australian practitioner. He selected the artists with a special emphasis on the diversity of approach and visual language at play in our country and each article consists of an introduction, interview and portfolio. CDC will present the work of four Australian photomedia artists at the celebrated Russian festival, PhotoVisa. The artists, Hoda Afshar, Ray Cook, Simon Harsent and Owen Leong, create fables that address variously hybridity, metamorphosis, dissolution and adaptation. Curated by Alasdair Foster, the exhibition will be presented at the Krasnodar Institute of Contemporary Art (KISI) in October and November 2013. ALASDAIR FOSTER has been named as the Commissioner for the Latin-American Pavilion at the 2013 Pingyao International Photography Festival (PIP) in China. The selection panel comprised Glen Barkley (curator at the Museum of Contemporary Art, Sydney); Isobel Ching (an independent curator based in Singapore); Andrew Varano (an artist and curator of OK Gallery, Perth); Leigh Robb and Tim Carter (respectively curator and special projects curator at PICA). Shan is an exceptional young artist with a distinctive vision that draws on his cultural heritage. That journey is now leading him to undertake creative research in Burma. His work was previously recognised when he won the 2012 Jennie Thomas Travelling Art Scholarship. 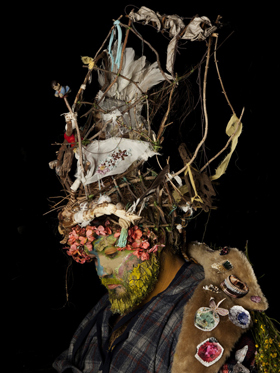 CDC will present the work of Melbourne artist Polixeni Papapetrou at a major South American festival this May. Fotográfica Bogotá is reputedly the continent’s largest photo biennale, reaching an audience of some 80,000 people. While in Bogotá, Alasdair Foster will present a paper at the Encuentro Teórico, Latin America’s foremost photo-theory conference, which attracts some 1,200 delegates from the across the continent. Any artist, gallerist or festival director in the West who feels life is tough; spare a thought for Issa Touma, the founder and director of the Aleppo International Photography Festival (AIPF), Syria. Plans for the 2012 festival were ambitious, with a new venue in a former power station and 48 local and international artists to present some 870 works. When they began work a year ago, no-one imagined that by September Syria would be in the grips of civil war and Aleppo at the heart of the conflict. Alasdair Foster has been elected the Asia-Pacific PhotoForum Ambassador, with a remit to help build new alliances between photographic festivals from across the Asia-Pacific region. In May 2012 CDC took at a look at the challenging issues of censorship. The season included two extended interviews and an article by Alasdair Foster, along with a Q&A of the views of 14 artists and commentators from Americas, Asia, Australia and Europe. Bringing together all the links to the various articles and Q&A responses, the OMNIBUS page is a one-stop access point for the entire season. Please join in by adding your comments at the foot of the page of any of the articles or Q&A rounds. FaceBook: at the foot of the right sidebar you can ‘FOLLOW CDC ON FACEBOOK’ by clicking ‘Like’. You can ‘un-Like’ at any time. Or you can visit the CDC FaceBook page here and click on ‘Like’ to receive updates via FaceBook. Email: in the right sidebar (between the items on iPad and FaceBook) you can ‘FOLLOW CDC BLOG VIA EMAIL’ by adding your email address in the box. You will be able to ‘un-follow’ at any time – it’s an anonymous and automated process. Newsletter: to sign up to receive CDC’s quarterly newsletter go here and then click the blue ‘SUBSCRIBE’ button and complete the form. Alternatively, simply click on the CDC icon on the left and complete the form.You can unsubscribe at any time. Newsletters are distributed by email. I just came to know that you‘ve edited a book called 《One Life One Place One Year–an exploration of place， time and ecology》 according to an interview,and i have been deeply fond of you publications reading your wisdom about the consulting human beings has led to.I tried but couldn’t find it.Havn’t it been published yet ? Looking forward to you reply. Mexico in China, China in Guatemala, Guatemala in Lithuania, Lithuania in South Africa, South Africa in Canada, Canada in Mexico: that’s what’s so refreshing about your connection concept, Alasdair. It decentralizes the medium of photography from the historically self-anointed and self-propelling power centers of the photographic world and reaches out to new sources of continuum and inspiration thus making our lens based medium, still rightfully called photography, the art of everyone as well as an art with massive potential to bring nations as individual entities together. this is a great and very informative website. Hi Alasdair. Congratulations for your web site. You are always surprising me in good sense. The architecture and the offers are really well done and it refreshes the cultural world. Alasdair is the greatest thing that has ever happened to Australian photography. guidance and support of my work.